Just about everyone (except my husband) loves chocolate. But how many of us think about using chocolate in savory cooking? It's the truffles, chocolate chip cookies, and decadent chocolate cake that fuel our cravings. Thinking outside the box is good once in awhile and using chocolate in a savory dish exercises creativity and sparks the imagination. Today I have a lovely Spinach-Pear Salad with Chocolate Dressing and Roasted Cauliflower with Paprika and Cocoa for you to try. 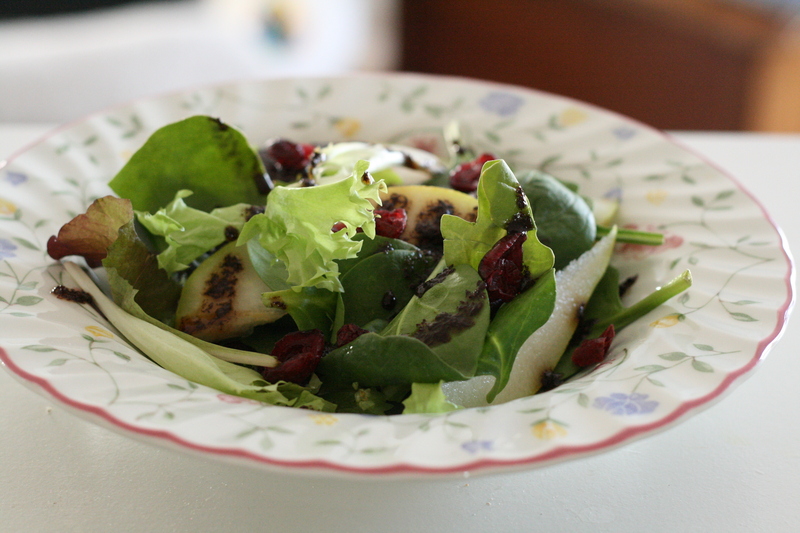 I made this salad with spinach, spring salad mix, and pears. However, as we were eating, we dreamed of substituting strawberries for the pears, adding Gorgonzola and toasted pecans, and later on we even suggested bacon. So, make the salad with whatever ingredients you think sound good to you and enjoy the sweet, tangy bite of this Chocolate Dressing. Place the balsamic vinegar in a small saucepan. Add the sugar and dissolve over a gentle heat. Remove from the heat and stir in the chocolate. Leave to cool to room temperature. Do not refrigerate or dressing will solidify. 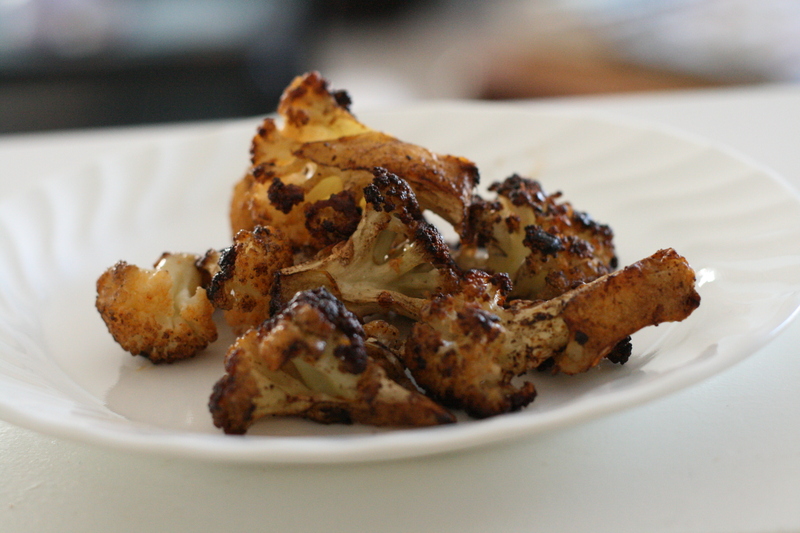 Roasted cauliflower is one of my favorite vegetable side dishes. I've made it often in the past, but this was my first time to try it with the cocoa and paprika. To be honest, I didn't really taste a strong note of either coming through. Perhaps the two added more to the overall color of the dish. In any case, I will definitely be repeating this -- I always make a full head of cauliflower and it is never enough. Preheat oven to 400F. Cut cauliflower into florets. Rinse and drain and pat dry. Spread on a baking sheet. Drizzle with canola oil and sprinkle with salt, pepper, paprika and cocoa powder. I probably used about 1 tsp. of cocoa powder for the entire pan, perhaps the same for the paprika. Use your hands to turn florets and make sure they are coated evenly. Bake for 25-35 minutes or until nicely browned and tender. I love an excuse to include chocolate in anything I can. Thanks, Heather!